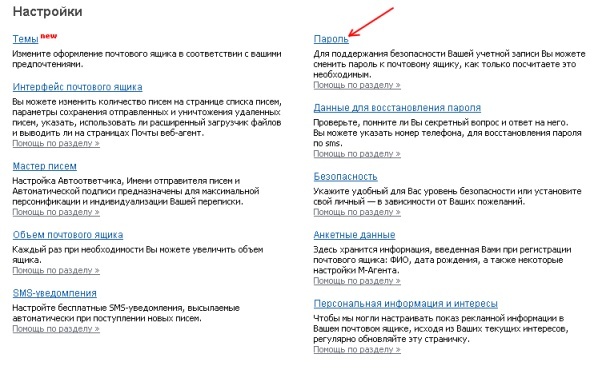 Most of the Internet users gets an email on Mail.ru website. This is not surprising, because this provides us with an excellent work without interruption, opportunities, as well as many additional functions. In this article, let's talk about, how to change the password in the mail. The first step, open the browser and go to the main page Mail.ru. Where you need to go to your account, To do this, enter your user name and old password. Further down the page in the them and click on the “Settings”section. Here is the section “Password”, go to him. Now you need to enter your old password twice. Remember, that all characters must be absolutely the same, even register is important. After this, store in a special field the new password. If all data is entered correctly, the system will issue a message of congratulation. Now confirm, that the operation is done not a robot, a real person, To do this with accuracy, enter the letters and numbers offered. It is commonly used English layout. In that case, if you can not make out the picture, it can be replaced. Save your work and test the new password. For this to reenter account. by the way, do not forget to write down the password on a separate sheet, otherwise you can lose it. Now you know, how to change the password in the mail.